You are here: Home / Brian Gale Surveyors / How Different Roof Coverings can affect the Appearance of a Property. How Different Roof Coverings can affect the Appearance of a Property. 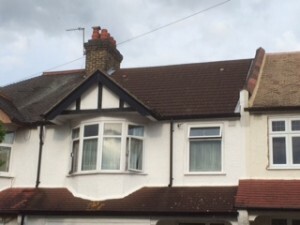 Whilst undertaking a Full Building Survey on a terraced house in the Addiscombe, Croydon area, it was interesting to note the different roof coverings used on the different properties. On the left hand-side the roof comprises of original clay tiles. These are now stained and discoloured. The clay tiles are showing their age and the Vendor would benefit from paying some attention to the roof tiles and possible replacing. The middle terraced house has much newer roof tiles – probably fitted around 10 years ago. The interlocking concrete tiles are very functional but are not as in keeping with the age and style of the property – although this is a matter of personal opinion and taste! Finally, the right hand-side property has opted for sand faced concrete tiles. Judging by their current condition the tiles were probably replaced about 40 years ago, but the condition of the roof suggests that it has recently been cleaned and overhauled.